The National Bureau of Statistics (NBS) has revealed that the average price paid by consumers for Premium Motor Spirit (petrol) in the month of March, dropped to N163 from N173 recorded in February. The drop represented an increase of 9.4 percent year-on-year, NBS said in a latest report. According to the report, the average price increased by 5.3 percent month-on-month to N163.4 in March 2018 from N172.5 in February and 9.6 percent increase month-on-month from N190.9 in January. The report stated that Taraba (N184.38), Jigawa (N180.93) and Ekiti (N173.89) were states with the highest average price of premium motor spirit (petrol). States with the lowest average price of premium motor spirit (petrol) were Kaduna (N147.29), Bauchi (N145.57) and Abuja (N145.00), it said. NBS also stated that the average price paid by consumers for automotive gas oil (diesel) decreased by 1.65 percent month-on-month and 12 percent year-on-year to N206.41 in March 2018 from N209.89 in February. States with the highest average price of diesel were Taraba (N254.29), Sokoto (N249.29) and Kebbi (N230.83) while states with the lowest average price of diesel were Abia (N185.83), Bayelsa (N187.50) and Delta (N189.58). Similarly, the bureau revealed that the average price per litre paid by consumers for National Household Kerosene decreased by 6.79 percent month-on-month and 13.66 percent year-on-year to N268.99 in March 2018 from N288.57 in February. 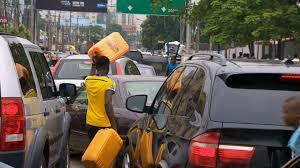 States with the highest average price per litre of kerosene were Nasarawa (N306.07), Yobe (N300.78) and Cross River (N300.68). States with the lowest average price per litre of kerosene were Abia (N229.35), Delta(N227.77) and Borno (N225.13, it stated. The statistics office also stated that the average price per gallon paid by consumers for National Household Kerosene decreased by 8.45 percent month-on-month and 19.57 percent year-on-year to N943.27 in March 2018 from N1,030.33 in February, while states with the highest average price per gallon of kerosene were Kebbi (N1105.00), Benue (N1096.67) & Jigawa (N1061.90).